You could tell people were thankful as they chatted on top of the rooftop patio. After a week of snowy, cold weather, members of the Edmonton CPRS chapter chased the last of the evening sun as they reconnected after the summer break. Jim Rudolph of JGR Communications expressed that, “Each time I come (to one of these events) I am happy to reconnect with members; I am excited to get back here.” Members of the board introduced themselves and it was easy to see the passion and excitement they had for the upcoming year events. 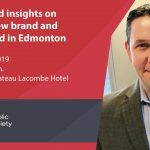 One of the highlighted events was the 2019 national CPRS conference, being held here in Edmonton. The theme of “Evolving Expectation, for Deliberate Communicators” was presented to those in attendance as a way of holding strong to the importance of professional excellence and knowledge amongst those who communicate with intention and understanding. At each of the future CPRS events leading up to June’s conference, there will be the ability to win the chance to attend the conference for free by tweeting a picture of you and the Evolving Expectations sign and the hashtag, #evolving expectations. You are encouraged to follow CPRS on Twitter for more details.